Twiddling, lobbing, hovering up, dressing, stringing and training were some of the procedures used in growing hops in Marden. 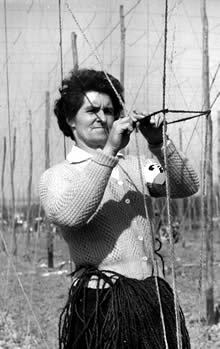 Circus skills were also useful in the hop fields or gardens, as they were sometimes called. Stilt walking or balancing on the back of a horse, who would patiently walk up and down the alleys, were means of attending to the stringing at the top of the poles. It would appear that hop farmers were endlessly resourceful – not for them deluxe tools, but part of an old bicycle, or even better, German steel from an old gramophone, would do equally well to make very adequate equipment. Or a door knob filled with lead as a lobber to help with the stringing. Hops were known from Roman times when the young shoots were eaten as a delicacy. It has been said they grow so fast that if you had a couple of hours to spare then you could watch them grow (9 inches in 24 hours). They are a very labour intensive crop, which has in time led to their decline. Therefore it could be a make or break crop financially, dependent on the weather and the pests. Then the mould, then they die. Hopping had a major effect on Marden and the surrounding villages. Oast houses for the drying of the hops abounded, and throughout the year there was the cultivation, harvesting and dispatching of the crop, providing work for many including the Poke Boys. Then in September there was the annual arrival from London of the Hop-Pickers in their thousands with their 3/- train ticket, bringing even the tin bath with them. Not only for bathing, but joining upturned umbrellas and other objects as easy receptacles for the picking. The church became involved with their Missions to the hoppers and the “Hoppers Parson” set up a hospital in Five Oak Green. Marden too had its Hoppers Hospital. A number of Gypsies swelled the ranks of pickers. At times the arrival of the hop pickers seemed like an invasion. Shops were boarded up and children were warned to keep out of their way. Many villagers however have warm memories of this cheerful army of workers, and remember with nostalgia the all-pervasive smell of hops at picking time. Some local people, known as homeworkers, worked in the fields alongside the visitors. Very few hop fields remain in production today. Let us hope that hop growing does not disappear entirely. We still have the oast houses albeit many of them are now just “houses”.